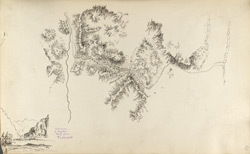 This pen-and-ink sketch map is one of two by A. Christie (perhaps Alexander Christie, Assistant Surgeon in Bengal, 1825, and Surgeon from 1840) contained in an album of 95 drawings (90 folios) by George Boyd (1800-1850) mainly of landscapes and monuments in the Deccan, West India and Afghanistan made between 1821 and 1844. The Khyber Pass is a 33-mile long passage through the Hindu Kush Mountains connecting the northern border of Pakistan with Afghanistan. It is one of the most famous passes in the world and has had a long and often violent history. Since Alexander the Great marched his army through the pass (circa 330BC) countless invaders have taken advantage of this strategic gateway to the plains of India. The Khyber varies in width from three to 137 metres and is walled by precipitous cliffs that range in height from about 180 to 300 metres.